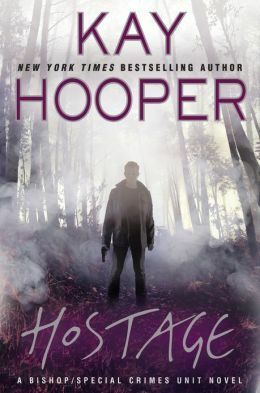 Kay Hooper's books have always had a slew of multiple POVs between characters within the book, which I never minded--although if not done properly, it could become a big, distracting, channel surfing mess. In this book, we see more than just multiple POVs, we actually see two sets of main characters and what's going on between them... Luther Brinkman and Callie Davis on one side with their own goings-on; Hollis Templeton (!!!) and Reese DeMarco on another hand with their happenings. And if you can't tell yet, or missed it when I mentioned it the first time, Hollis is my favorite Bishop/SCU character--something about her snarkiness speaks to me. And while at first I didn't care for it (the switching of narrative between Team Callie/Luther and Team Hollis/DeMarco), after I thought about it, I decided that it actually made sense for this story and how everything connected in the end. In the long run, I decided to bump the rating up to an average 3.0 Stars because some time to think on the book made me realize that what I had found frustrating really wasn’t all that bad. The first chapter felt like there might be a sort of “Game of Cat and Mouse.” But then that doesn’t actually happen and I move on. Again, there is a lot of “enigmatic” talking in circles going around and that gets more frustrating every time it happens and is really tugging at my last nerve. Bishop does it and it pisses off his operatives; Callie does it and it frustrates Luther… and me. Why can’t these people just stop keeping secrets in the name of “The Universe doesn’t think it’s time to reveal these facts yet?” It’s annoying! A creepiness factor DOES come into play, even if it isn’t entirely spine-chillingly creepy. But we’ve got an evil killer being possessed by evil as one set of our good guys are trapped in an isolated cabin in the woods--MAJOR POTENTIAL for story! And then we’ve got our other set of good guys investigating something in an extremely haunted mansion--DOUBLE MAJOR POTENTIAL for story! And then there’s Hollis and her strong mediumistic abilities and her ever evolving psychic abilities, trapped in a haunted mansion that is very, very haunted with lots of negative energy. I got excited about that one. It took a long time for the book to actually start being a story rather than spending time discussing backstory and speculating current story. Because it wasn’t until the book itself started hinting that the two separate story lines in Hostage might be related that things started getting a bit more exciting. And even though I’ve come to like the back and forth narration between the Callie/Luther pair and the Hollis/Reese pair, at the time, I found it hard to follow. Because until you reach the end of the book, the two tangent storylines just feel as if they should have been two different stories in two different books; there wasn’t even really a feeling that both tangents might intersect except that we know this is how a Kay Hooper book operates. And I have to admit: I liked the new characters, Callie Davis and Luther Brinkman. And I feel like they kind of got cheated on their story because of Hollis and Reese taking up the other fifty percent of the book. Because the entire time that the story was progressing, I kept looking forward to seeing more of the Team Hollis/Reese side of the book and barely paid attention to the Team Callie/Luther side of things. It wasn’t fair to them--I like following Hollis more than any other of the SCU or Haven operatives. But the Callie/Luther storyline and romantic developments had a lot of potential to be a singular, individual story all on its own. But unfortunately, they had to share. A lot of the story got told through our exposition fairies: the SCU leader Noah Bishop and the Haven leader Maggie Garrett nee Barnes. Every few chapters we would jump back to those two to explain the happenings in the Callie/Luther world or the Hollis/Reese world… you know, in case, as the reader, you couldn’t quite figure out what was going on because “The Universe” was being overly vague again whenever we were actually reading about the two main conflicts with the two main couples.